The East Room of the White House — with its vaulted ceilings, ornate chandeliers and gold curtains — is the closest thing to a throne room the United States has. When set up for a presidential news conference, as it was on Wednesday morning, it is magisterial. The president is announced, and the doors to a long hallway swing open. He steps onto the podium, towering over reporters squeezed tightly into the wooden chairs before him. It feels a bit like an audience with a king. And on Wednesday, the king was angry. Donald Trump held this formal news conference, only the second of his presidency, to respond to the results of the midterm elections. It was, he said, "very close" to a "complete victory" for Republicans, despite the fact that his party lost control of the House of Representatives for the first time in eight years. After spending weeks of battering and belittling his political opponents, the president opened by changing his tone and speaking of bipartisanship. When it came time to interact with the gathered journalists, however, the olive branch was replaced by a mailed fist — as it always seems to be. The president accused one reporter, who is African-American, of asking a "racist" question. He said he's not "a big fan" of another. And he repeatedly barked at persistent questioners to sit down. The real fireworks came when CNN's Jim Acosta tried to ask a series of questions, culminating with the president accusing him of being a "terrible person," mocking his network's ratings and reiterating his own contention that outlets that promote what he considers "fake news" are enemies of the people. As a reporter for BBC News, I was seated a few rows behind and to the left of Acosta as he questioned the president, who at one point huffily stepped away from the lectern while the reporter continued to talk. The White House would later accuse Acosta of "placing his hands" on an intern trying to take his microphone away — and suspend his press credentials. From my vantage point, I thought there may have been nonhostile contact between the two — in stark contrast to the obvious verbal hostility between reporter and president. A review of video from the incident corroborates this. Acosta has a reputation as a dogged reporter, but his time at the White House during the Trump administration illustrates the perils of covering a president who uses dust-ups with journalists as a political tactic. When the news cycle turns against him, one of the president's first instincts is to criticize those who report the news. And journalists often take the bait. They've spent their whole professional careers dedicated to their craft, after all, and it's human nature to take such slights and derogations personally — and to talk about them in private and then in print and then on-air for days. That's exactly what the president wants. An us-vs.-them debate between Trump and media personalities is friendly terrain for the White House. It feeds into the perception held by conservatives across the country that journalists, who are predisposed to questioning authority, are out to get this president. It diminishes the impact of the stories reporters spend so much time covering. And as a further complication — and temptation — it also can benefit outlets such as CNN and reporters such as Acosta, who see followings grow, ratings soar and advertising dollars pour in with every new Trump-related controversy. There's a mirror to this perception on the left, casting "the media" as some sort of cohesive whole that can stand up to the president — as opposed to a chaotic mass of individuals and outlets, each vying for a small slice of the story. When people ask me why reporters don't just walk out when a news conference turns ugly as it did Wednesday, I chuckle. Telling journalists to walk away from a story is like asking them to stop breathing. Sitting next to me in the East Room was a Korean reporter, perched on the edge of her seat. Her hand shot up every time the president appeared poised for a new question. "Mr. President, sir! North Korea! North Korea!" she said pleadingly. Try asking her to give up a chance to get a choice line from the leader of the United States about an issue that is of the utmost importance to her audience. I like to tell friends and colleagues that covering Donald Trump can feel like falling into quicksand. The more you struggle, the more you fight, the quicker you sink. Instead, the best strategy — the only way to survive — is to take a deep breath. Find solid footing. And move deliberately. That's what the story and the audience deserve. 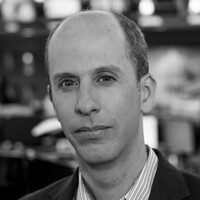 Anthony Zurcher is senior North America reporter for BBC News based in Washington, D.C.